The latest buzz in e-tailing is omni-channel commerce – the concept that retailers should provide a seamless customer experience across all devices, making every interaction your customer has with your brand a holistic sales opportunity. Whether researching or shopping on their computers, mobile devices or at your brick-and-mortar store, consumers now expect to relate with your products, services and marketing. So how do you meet the new consumer demands? Let’s take a closer look. As opposed to multi-channel commerce, which perceives different sales channels as distinct marketing avenues, omni-channel commerce enables consumers to interact with your brand as a whole regardless of the point of contact. Central to omni-channel is the idea that it’s up to the customer to choose how to buy from you and that they should be able to do it through whichever channel they want and from whichever channel they find you. For merchants, in the age of the cloud, both the technology and the infrastructure are in place to provide customers with a seamless experience – meaning, both product and customer data remain consistent and specific across all platforms. But the real reason you need to go omni-channel is that it’s not just the latest new marketing technique (it wasn’t dreamed up by industry gurus) – it’s simply the way shopping habits among the public are developing. Omni-channel commerce is what consumers want and expect from you. The fragmented sales and marketing tactics of multi-channel commerce mean that businesses are splitting their resources into what amounts to several similar but channel-specific brands, while in omni-channel commerce, the full force of your marketing can be unified across all channels. Marketing in any single channel benefits brand awareness in all of them and increases consumer confidence overall. The concept that different channels consist of different audiences is false. 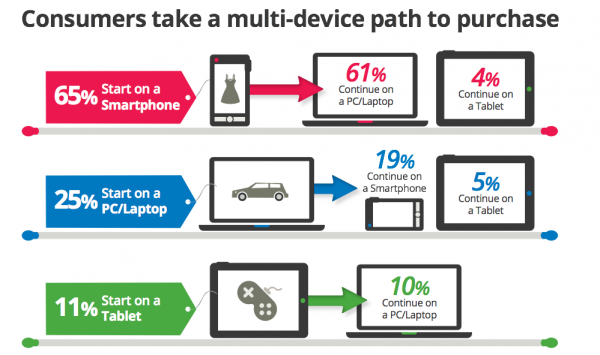 Consumers take a multi-device path to purchase. Brick-and-mortar stores are a component of the supply chain in which, even when purchases are in the store, they are researched using other devices (webrooming) or vice versa (showrooming). Instead of perceiving your brand in terms of specific touch-points, you need to maintain consistency in your products and promotions across all sales avenues. For example, logos and colour schemes on your website need to match your product displays in store. Similarly, prices (including sales) need to be the same regardless of the channel. Device2Web: The consistency of branding and marketing across all connected devices, such as a responsive web design that allows online shoppers to experience the full scope of your brand whether they are browsing on a phone, tablet or desktop computer. Brick2Click: The consistency of the consumer experience both online and in-store, such as a purchase history that is shared across channels and customer support that is available in any channel regardless of where the purchase was made. Omni-channel marketing is consumer-first, not channel-first. The secret to success lies in data management. Consumers expect you to remember their progress as they jump from one device to another. Therefore, sharing data in real-time across all channels is integral to providing a satisfying customer experience. For example, when you sell a product in-store, your inventory should update in real-time on all channels. Additionally, if the customer has an account with you, that purchase should appear in their purchase history online, even though the purchase was made in-store. Gathering data about your customers allows you to shift from channel-based marketing to customer-based marketing. Remembering what’s in someone’s shopping cart is only one step in personalising their customer experience. You should also followup on incomplete purchases with personalised emails and let them know about promotions and offers based on their location, shopping habits, history or social network preferences. Rather than resisting showrooming habits, encourage them. Add QR codes to in-store product displays so that customers can use their mobile devices to collect further information, read product reviews, etc. This encourages customers in your store to go directly to your website and stay engaged with your brand and products, rather than leaving your “environment” by googling information they’re looking for. Another way to engage with and convert more customers is by adding QR codes to your store window displays – this is your chance to entice passing foot traffic to your website even if they were just casually window shopping without any intention of stepping foot inside your store. It brings more customers into your store, opening up another avenue for marketing. 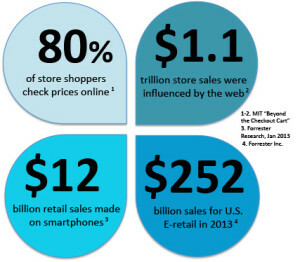 Digitally-savvy shoppers are researching their purchases before entering your store. They come to you already well-informed about your products and prices and they expect you to provide them with even more information. In a Retail Systems Research study, 82% of respondents said the role of retail staff in customer service is more important than ever, so a successful approach will require knowledgeable, well-trained employees. Omni-channel integration requires an investment of both time and money, but it’s one that’s bound to pay off since omni-channel shoppers outspend single-channel shoppers by almost 50%. To prepare your business properly, inter-departmental communication needs to be smooth and robust so that brand consistency and marketing strategy are strong and well-understood across the company. It’s an investment in success and Why Online Retailers are Embracing Omni-Channel Commerce. For more of the latest news and advice in the world of omni-channel retail, subscribe to the DalPay Blog and follow us on Facebook and Twitter.